Your campers won’t ride any horses or capture any flags at the Adler, but they will have the whole Universe at their fingertips. With tools like telescopes, programmable robots, and high-altitude balloons—and new friends around every corner—Adler summer campers share adventures of cosmic proportions. The Adler Planetarium offers a variety of unique summer day-camp experiences for campers entering preschool through 10th grade. Young space and technology enthusiasts can use their imaginations, get creative, and explore their Universe together just like scientists do. Please note that summer camp programming is repeated each session. Each type of camp will have the same curriculum each time it is offered. Registering for more than one session of the same camp program is not recommended. 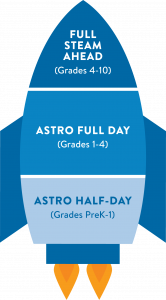 However, if your young child benefits from repetition, you are welcome to register for multiple sessions of the half-day Astro Camps. For children in PreK through 1st grade Fall 2019. For children entering 1st through 4th grades Fall 2019. Science, technology, engineering, art, and math (STEAM) camps for children entering 4th through 10th grades Fall 2019. For children entering kindergarten through 5th grades Fall 2019. This camp is a full week experience at the Adler Planetarium, Field Museum, and Shedd Aquarium. Adler kids reach for the stars (and grow) with us! Adler camps and teen programs are designed to challenge, delight, and support children of all ages—and appeal to individual kids as their minds grow and change. This year, a kindergartner loves to look up at the Moon. Next year, she may want to learn about the technology that made it possible for people to walk on it. A few years later, she’ll be programming robots. And by the time she’s in high school, she can design an astrophotography experiment, launch it into the stratosphere, and snap a space-based picture of a lunar eclipse. Registration is now open. Limited spots remain for Adler Summer Camps. Please be aware that once you submit your registration, there are no full refunds. Cancellations made until and including May 1 will incur a 10% cancellation fee. There will be no refund for cancellations made after May 1. The Adler may cancel a camp due to low enrollment up to 72 hours before it is scheduled to meet. In these (rare) cases, full refunds will be issued to all registrants. For questions regarding Adler camps, please check our 2019 Summer Camp FAQ. If you can’t find what you’re looking for, email us at summercamp@adlerplanetarium.org or call 312.322.0329. For questions regarding Summer Worlds Tour, please check our 2019 Summer Worlds Tour FAQ. If you cannot find the information you’re looking for email us at camp@summerworldstour.org.